Last fall I returned to Bhutan at the invitation of the Institute for Language and Culture Studies, located just above the oldest dzong in Bhutan at Simtokha, a school founded back in the 1960s by Dilgo Khyentse Rinpoche, now part of the Royal University of Bhutan. I was to join several other faculty members for a workshop on translation methodology for thirty Bhutanese translators, carefully selected by application, ranging in age from mid-20s to late 40s or so, and including two monks and two young ladies. 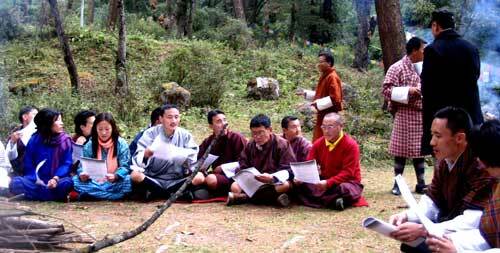 All these participants were expected to be able to work within Dzongkha, the official language of Bhutan (despite the fact that only a couple were native Dzonghka speakers, there being many languages spoken throughout the country); English (the medium of instruction throughout the modern educational system, founded in the 1960s under the guidance of Father Mackey from New Brunswick), and what is called Choekey, the “dharma language,” meaning written Tibetan. The fact that neither of the target languages—English and Dzongkha—were native to most participants is an interesting fact and quite daunting for most translators. Not knowing a word of Dzongkha, I can only surmise that the fluency of the participants with both that and English was impressive. Their knowledge of Tibetan was more varied, even though it is closely related to many Bhutanese languages, with much shared vocabulary. 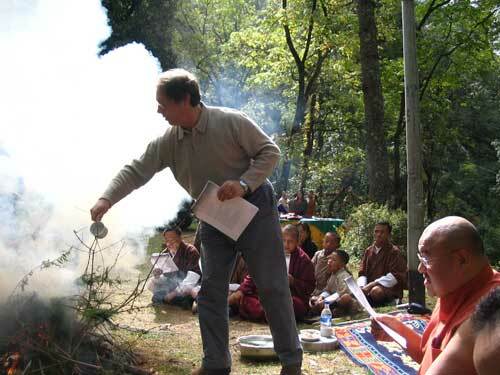 The other teachers included Lopon Lungtaen Gyatso, the Institute’s venerable director, educated in the Tibetan monastic shedra system in south India, and who at one time was fluent in spoken Sanskrit during his years of studying it in Varanasi; Dr. 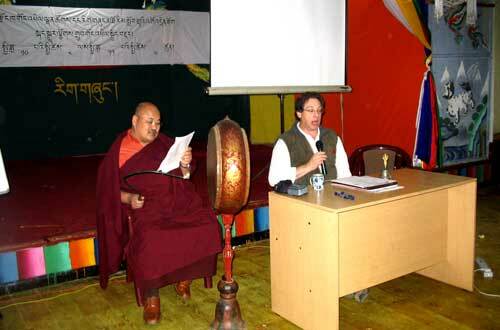 Karma Phuntsho, also educated in the shedra in south India, who went on to complete a Ph.D. at Oxford, writing a brilliant thesis on Mipham’s madhyamaka writings; Dr. Francoise Pommaret, a French ethno-historian working at the institute, author, and leading expert on Bhutan and its culture; Pema Wangdi, Bhutan’s only Western-trained linguist; and Dorje Gyeltshen, an expert in Dzongkha, as is Pema. The Dzongkha Development Commission was our supporting host and partner. To say that I was feeling somewhat intimidated to be among such colleagues would be an understatement. But I soon discovered what I believe was my most valuable asset: I was the only native English speaker! Everyone made me feel very welcome, and a deep and hopefully lasting friendship developed quickly among us all. This was a hands-on training from the start, with the intention of covering an ambitious curriculum of many genres of literature, translation theory, and practical implementation. While we knew the scope was likely too broad to be able to approach each topic with great depth, Lopen Lungtaen provided just the right amount of assurance that this was a first or next step in a long process, and his confidence and encouragement were infectious. 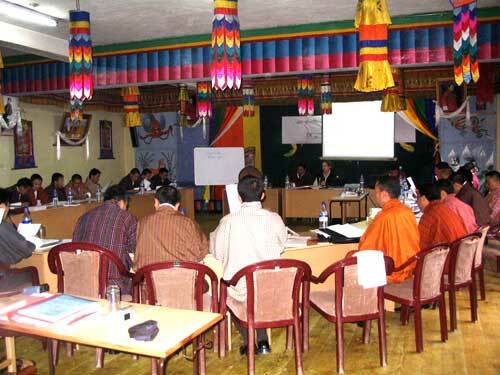 Which brings me to the main topic I wanted to share about the experience of translating in Bhutan and for the Bhutanese. In just the last few generations, English has become an extremely important second language for many Bhutanese. Dr. Karma and I chose theHeart Sutra as our first liturgical/philosophical text to present, and it took several sessions to read through the Tibetan, which was translated from Sanskrit over a thousand years ago. 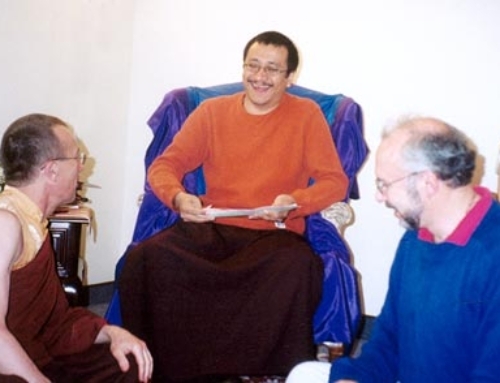 Some of the students understood the dharma presented here quite well, notably the monks and a few others who had received a technical Buddhist education. But I daresay that most of them knew very little about these prajnaparamita teachings on emptiness, and I found myself, with Dr. Karma’s most kind encouragement, in a rather odd position of having to teach dharma to the Bhutanese. I had done a little teaching there in the past, but it was mostly to fellow Western pilgrims and tourists whom I accompanied to the many sacred sites of the region. I was continually haunted by my guru’s presence, knowing that he had said to us that in the future we must bring the dharma back to the lands of its origin. After we had completed our reading of the sutra, some of the students asked me to teach them how we practice this in English. At first, I didn’t understand what they meant, as I replied, “We just chant the English as you would the Tibetan.” But they wanted to know exactly how: did we use any instruments, how are the words recited, and so forth. We quickly procured a very decorative drum, substituted a bell for the lack of a gong in our classroom (its decor really being that of a shrineroom), and I demonstrated our staccato-monotone chanting style, marked by a drum beat on each syllable. We passed out our NTC translation and launched into what I thought was a very ordinary, everyday occurrence for some of us in the West. As soon as the chanting concluded, there was a gasp of excitement in the air. Clearly, they were very moved and somehow in awe of what they had just done. I was quite taken aback by their reaction, as it had seemed so ordinary to me; and so it took some time to unpack what had happened for them, which I think can be summarized by two main points. The style of chanting strongly resembled, even sounded quite similar to, the way it is done in Tibetan, and so this was something familiar to the Bhutanese and thus we could say “authentic” in tone. And, amazingly, they actually understood what they were saying as they chanted along—the words and their meaning coming together at one point. I daresay this was a new experience for most of them, not to mention the fact that we had just finished studying this text in some detail, which I imagined further enhanced their understanding. The place was buzzing with the excitement of dharma practiced in another language, and everyone wanted to talk at once about the implications. When I suggested that they must translate the Heart Sutra into Dzongkha, a hush fell over the room, as this was in some sense heretical. But the Buddha himself taught in the vernacular, and for the dharma to penetrate fully, it must be in one’s native language. Little did I know that none of the other languages of Bhutan were yet written ones! What an interesting and complex dilemma indeed. With the success of our first English dharma adventure, they obviously wanted more, and so beginning the next morning, we xeroxed all of our customary morning chants in English and began the day with them, followed by a brief period of meditation. Translating the dharma seemed to provoke a much bigger experience of its meaning than any of us had planned. As a postscript, only a few days earlier, I was fortunate to meet Dasho Samdup, one of the first medical doctors in Bhutan and a very dignified gentleman. I learned from his son, Nam (short for Namgyal), proprietor of a lively sports bar just a block from my hotel, that his father was the grandson of the legendary Lama Kazi Dawa Samdup, who was a preeminent translator of dharma from Tibetan into English. 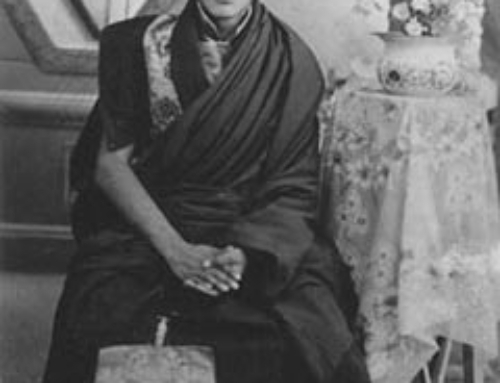 Lama Kazi Dawa Samdup was the Buddhist teacher of the American W.Y. Evans-Wentz, hired by Evans-Wentz to translate The Tibetan Book of the Dead and Tibet’s Great Yogi Milarepa, among other texts, for which Evans-Wentz served as editor in the early part of the 20th century. Dasho Samdup kindly brought out for me all the family memorabilia from his grandfather’s era, and we talked at some length about this great pioneering translator. What had in part begun with this noted Bhutanese scholar was in some sense coming full circle.